Christian Science services were first held in Williamsburg in 1919 at the residence on Nicholson Street now known as Tayloe House. While visiting in Chicago the previous year, a Williamsburg resident received a healing through Christian Science treatment. As people interested in Christian Science increased in number, other locations were used for services—the public library, a room at The College of William and Mary, and in 1930 a home on Griffin Avenue, where the Sunday School was organized. In 1936 a building at the corner of North Boundary and Prince George Streets was used for services and a Sunday School, Wednesday evening meetings, and a Reading Room. Recognition as a Christian Science Society came in 1942. The present church property was purchased in 1952, and during that year recognition as First Church of Christ, Scientist, Williamsburg, was granted by The Mother Church, The First Church of Christ, Scientist, in Boston, Massachusetts. 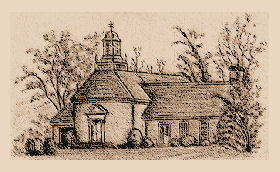 In 1957 plans for a church of Georgian-style architecture were adopted and the cornerstone laid. During the period of construction, services were held at the city courthouse, and the former location at North Boundary and Prince George Streets was redecorated as a Reading Room to accommodate visitors to the Jamestown Festival. 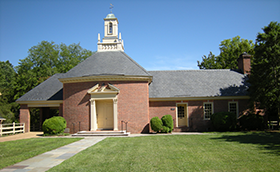 Through generous contributions of individual Christian Scientists and branch churches throughout the United States, as well as gifts of local members, the building was completed in 1958, providing room to accommodate church services, the Sunday School, and a Reading Room. Dedication services were conducted at the church on December 13, 1970. In 1976 the Reading Room was moved to 218 North Boundary Street. In September 1985 the church purchased the adjoining lot and dwelling on the corner of Jamestown Road and Burns Lane from Mrs. Alma Page Ransone. A grant from The Mother Church for partial payment made this purchase possible. In March 1986 the dwelling was made available for use as a community clothing closet for the needy. 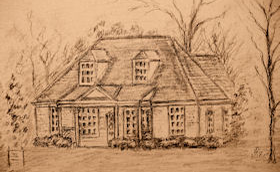 In the spring of 1996 the dwelling was razed and, in the fall, construction began on a Sunday School building that could serve during the week as the Reading Room for the present time. In March of 1997 Sunday School classes were first held in the new building and the Reading Room opened at that location. The mortgage was paid off in June 2005.